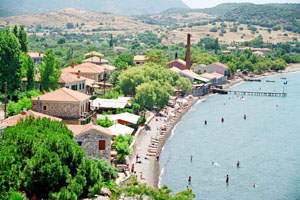 To the west, towards Mythemna (Molyvos), there is another beautiful beach, Ammoudeli, and the villages of Lepetimnos, Argennos and Vafios amongst lush vegetation the green slopes of Mt Lepetimnos. 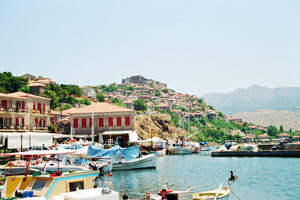 Molyvos perched on the western tip of the island is another important resort. Its roots are lost in the prehistoric period. Its one of the most picturesque and well-preserved medieval settlements in the Mediterranean build amphitheatrically on a rocky hill, complete with its medieval castle. While there you can visit the Public Library, the Public Gallery and the Archaeological Collection. 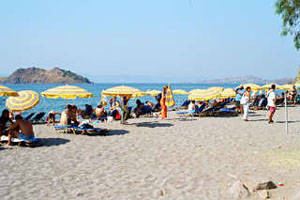 To the east of Molyvos, at the very top of the island is Eftalou, with a good beach and the thermal springs for swimming and relaxation.Heading south from Molyvos, you will arrive at Petra, another well known resort. 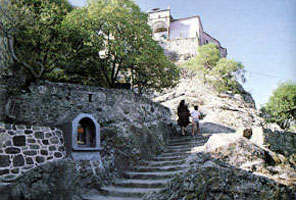 It was build at a plain around a huge rock, on top of which stands the church of b. Other sites worth visiting are: the church of Agios Nikolaos (basilica of the 17th Century) and Vareltzidena's Mansion, build in 1740. If you follow the coastal road westwards you will arrive at the cosy beach of Anaxos while a secondary road to the south east will take you to the green hamlet of Pyrgi. Continuing on the same secondary road you will arrive at the village of Stipsi and from there skirting around mountain Lepetymnos you will reach the Monastery of Ypsilometopo.